certificates at the CNY Boat Show in 2010. Syracuse, NY, January 18, 2013 – The US Coast Guard Auxiliary and New York Sea Grant are partnering to offer Young Boater Safety Certificate Training at the 2013 Central New York Boat Show at the NYS Fairgrounds in Syracuse, NY. The free two-part course for youth ages 10-17 will be taught from 6pm to 8:30pm on Thursday, February 14 AND from 9am to 2:30pm on Saturday, February 16 in the Horticulture Building Seminar Room. Pre-registration for the Young Boater Safety Certificate Training is required. Contact New York Sea Grant at 315-312-3042, slm22@cornell.edu. 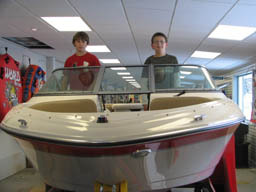 1 Comment to "Register the Kids Now for Young Boater Safety Training"
Any boater safety training helps to bring about something very important: AWARENESS!